If you like epic fantasy, I mean really long, luxurious epic fantasy, a book you can lose yourself in for a while and travel to another time and place, then read Dawn of Wonder by Jonathan Renshaw and enter a world you will love and meet characters that will become old friends. Dawn of Wonder is the first book in a series called The Wakening. I am eagerly waiting for the next book in the series and I know I’m going to resent the wait. I want to step back into this world and see what Aedan, Kalry, and everyone else will do next. The characters in Dawn of Wonder are superbly rendered. Jonathan Renshaw takes his time painting them detail by detail until we feel we know them like old friends. First and foremost, for any book to be a good book it must be written well. Jonathan Renshaw writes in a style that I love. He moves the story along at a crisp pace, but at the same time pays attention to detail. That is why, despite moving quickly, Dawn of Wonder is over seven hundred pages long. Don’t worry; there are no long boring passages. Every word is something that adds flavor, character, and tone to the story. I especially enjoyed the chapters concerning the Royal Academy. This is a coming of age tale as much as it is an adventure and young Aedan is a smart young rascal in the tradition of Tom Sawyer, and the best thing for a character like that, in my opinion, is a good dose of military training. Great world building, great characters, great writing, and a great plot that unfolds at an appropriate pace make Dawn of Wonder a must-read for the fantasy lover. Especially fantasy lovers who like to get lost in a magical, medieval world. 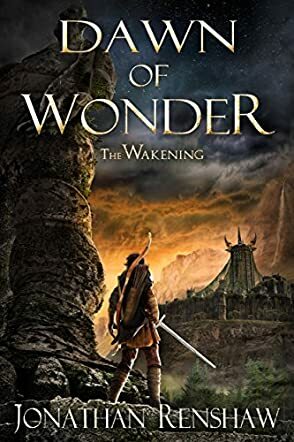 If you are tired of short-ish books that claim to fall into the category of epic fantasy, then you should consider reading Dawn of Wonder (The Wakening Book 1) by Jonathan Renshaw. I haven't read anything like this for a long time. The book was long, epic in length and plot, and wonderfully enjoyable. But what is it about, you wonder? The main character, Aedan, is a boy who isn't quite the one you'd pick first as a hero if you met him. Tragedy visits him early in life, and his father decides that it is time to leave their home. He takes a dangerous route, through an area called DinEilean, past the mysterious fortress of Kulthum. I thought that place was fascinating and it felt like there was so much history to it. It just felt interesting. I wanted to know more about it, and was disappointed when the party left - but later you learn a bit more about the place. Eventually, the family ends up in a different city, and Aedan decides he wants to become a marshal to bring justice to certain people. It is not an easy path for him, but he manages to make friends. However, all is not well when his adventurous spirit takes him to places he should not be, and he overhears words he should not hear. Dawn of Wonder by Jonathan Renshaw is just the first book in a series. So much happens here. It does indeed feel epic, and it is a proper journey. The characters are well developed, and when there are losses, you feel them. You don't just shrug and move on. I can't recommend this book enough. I also love that there are no grammar and spelling mistakes. Nothing to disturb the reading experience. I am definitely looking forward to the next book. The design is also well done. Of course, there have been many other fantasy stories about boys and girls coming of age and going on fantastic journeys, yet this one feels new, exciting, and I just loved it. Aedan is only a child but, at the same time, he knows more than many in his town. Though not everyone has enjoyed this throughout his life, they will come to see him differently when he is able to spot the inconsistencies of the new Lieutenant who has come to ‘save’ them from the slave traders. There’s something happening that isn’t quite right and only Aedan is able to see it. But when things start to go wrong, the entire town just might be against him, rather than the bad guys, and it could result in big problems. When Aedan and his family are forced to flee, will it possibly be to save the ones they love and punish the ones who have done wrong? You’ll have to wait and see for yourself in Dawn of Wonder: The Wakening. This book was a really interesting read. I loved the characters, especially Aedan, Kalry, Fergal, Peashot, even Aedan’s family (although they’re not the best). There are plenty of interesting characters and lots of things going on all the time. I loved the adventure and the romance that continue throughout. If you like either, you’re going to love this entire book. I would definitely love to read more of this story and get to know even more about the characters. Dawn of Wonder by Jonathan Renshaw is a book I would be happy to read again and again (and I will when I get a chance to read the next one). Excellent book. I really loved it. Dawn of Wonder (The Wakening Book 1) by Jonathan Renshaw introduces us to a high ranking officer who enters Mistyvales at full bore and sends the little town into an upheaval. The country folk of this sleepy town get shaken down to their core, but then there is Aedan who is full of fire and adventure with a scruffy look to match. Most of all, Aedan does not think this officer is who he seems to be. A journey starts from there, a risky - some would even say foolhardy - one that is only the beginning of what will be discovered as events unfold. Hostile nations and even darker forces come to light with an ancient power beginning to breathe. What will happen to the people here and our adventurer Aedan? Diving into a fantasy book, you really want to lose your sense of the real world you are sitting in and enjoy the world being created within the pages. Not all books create a rich world that allows you to do that, but Dawn of Wonder does. A beautiful coming of age story with a cast of rich and interesting characters. It is hard not to be drawn to Aedan from the moment you meet him. This is a wonderful, meaty story that really sets up a world of wonders, allowing the reader to feel connected to the people within the pages. It makes me very excited to see what Jonathan Renshaw is going to do next with these characters. A nice long read, written cleanly, and just a wholesome adventure with a fantastic and exciting lead character. I would highly recommend this book for coming of age readers and adults alike. Jonathan Renshaw has written a fantastically epic story about Aedan, the young village boy, and his journey to bring peace back to his hometown. Aedan is a young boy who has a quick wit and a mind for strategy. He enjoys using his imagination and taking his friends along for the adventure. All is well in his world until a mysterious rider shows up and changes everything. From that point, Aedan's life is forever changed. Now he has to flee his hometown if he ever hopes to survive. In his struggle for survival, Aedan decides to become stronger to protect what he holds dear. What other choice does he have but to become a soldier? Join Aedan on his journey across foreign lands and in his quest to become a soldier. I absolutely loved this book. Jonathan Renshaw wrote it so well that every page was an adventure. By the time I finished reading this book, I had gone through a whole range of emotions. From anger to fear. Happiness to sadness. And let's not forget the witty dialogue from the characters. There were scenes that were cleverly written to make the reader burst out laughing at the hero and his companions' antics. Each character was well written and developed so that it felt as if you were part of the story as well. Although the story is long, there is not a moment that you want to miss when you start reading. Reading this book is like taking a step back into your childhood years and your imagination. I recommend this book to everyone, especially Harry Potter fans and those that loved the Inheritance series. I can't wait for the next book in this series.